I've got some readers who need help. They've stumbled upon large insects they cannot identify. Can any of you help? I know there are some great sites out there to help ID insects, but I wouldn't want to deny you the opportunity to show off your entomological skills. First we have Matthew's little friend. Note its wingedness and beady little eyes. I also see a hint of malevolence in its stance. Then we have Mr. Tusk here. Victoria came across this 4 - 5 inch, tusked monster while rolling into her garage. It refrained from eating her, which has left her wondering what manner of beast it is. I'm thinking it's devil spawn, but I don't know the taxonomy on that. Pam sent me this article that details the misadventures of one Aaron Dallas, who had recently traveled to Belize. 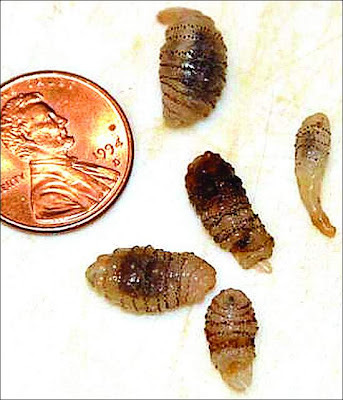 See the maggot-looking insectoids below? You're staring at the five bot fly larvae that were pulled from this poor fellow's scalp. He described it first as if someone were pressing into his scalp with their knuckles, then with a needle, and then with a nail. It was excruciating. You can read the article for more lovely details. As for myself, I'm going to cancel my flight to Belize and instead stay cooped up in my house, with the doors and windows sealed. And I'm going back to wearing my tinfoil hat. Thanks for the link, Pam. 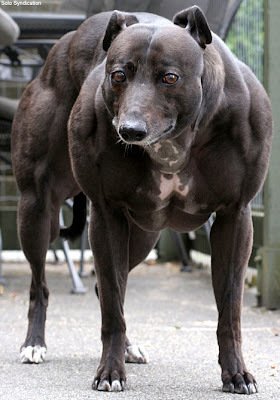 In the wake of Wendy the Whopper Whippet, Aaron sent me a link to a few more over-muscled critters. I found the cows on the site to be particularly noteworthy. 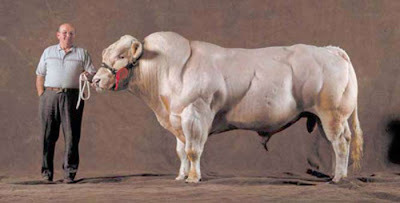 The sad thing here is that these cows are often bred to isolate the gene that hinders the production of myostatin, resulting in the large, lean muscle mass you see here. 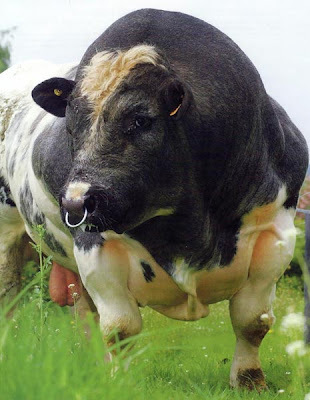 Some advocate eliminating these strains of cattle (the belgian blue below, in particular). I don't know about that, but I do intend to ask the next restaurant that serves me a burger if they serve meat from cattle that have myostatin problems. I'm sure the server will know the answer. 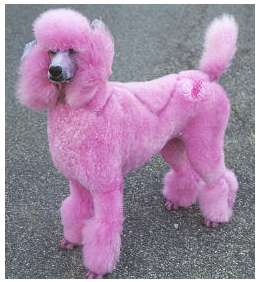 I know the standard poodle is beloved by many, and that they tend to be big hits and champions at the dog shows, but seriously, folks. Look at this. Look at this! This act of canine vandalism looks like the work of a Japanese consumer craze. I'll file this under fads gone horribly, horribly wrong. Thanks for the photo, Elizabeth. What Are Those Languages for? 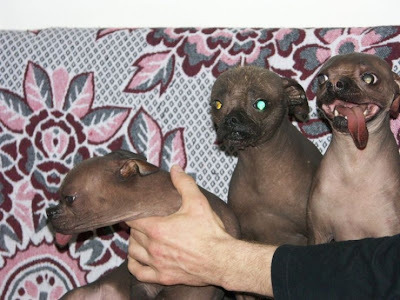 I can't read the Russian on the site posting these photos, so I don't know what kind of dogs these are. I tried using Google's translator (link), but couldn't glean any additional information. 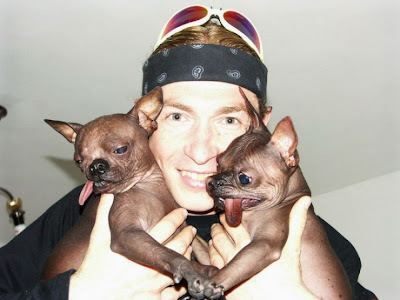 In fact, the translation was rough--the word 'tongue' features prominently in the Russian version (no surprise, given the puppies), but Google translated the word as 'language'. So you end up with Russians commenting on the photos and asking what the dogs use those languages for. I can see why the Russian to English is still in BETA. 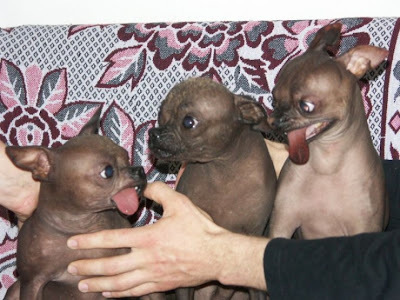 Those over-sized tongues and the hairlessness are reminiscent of a Chinese crested / chihuahua mix. That's the best I can come up with. But anyways, enjoy the photos, enjoy the pups, enjoy the lolling tongues and oily skin, and enjoy the Russians enjoying their dogs. Thanks for the photos, Katrien. There are few things as mundane, as banal as houseflies. They only capture my attention when they buzz around my food, or when caught by a gifted photographer. Below are two shots taken by Leigh Hall. The first one is of a fly shmorgesborg. 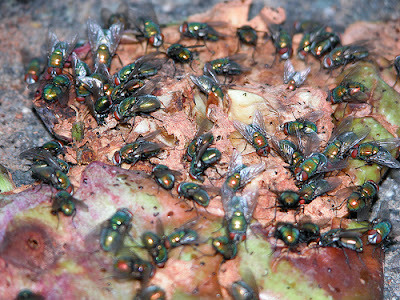 Now, I rarely inquire into what exactly a swarm of flies is eating. I hardly ever like the answer. But in this case you'll be happy to know that they are eating a rotten apple. That's pretty harmless, huh? This last shot is exactly what it looks like. It needs no commentary. 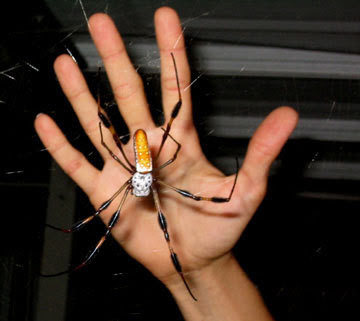 Is this one of those argiope spiders? I had no idea they got this big. The world just became a much scarier place for me. I must find a dark--fumigated--corner in which to curl up and hide. Thanks for the photo, Nicolle. 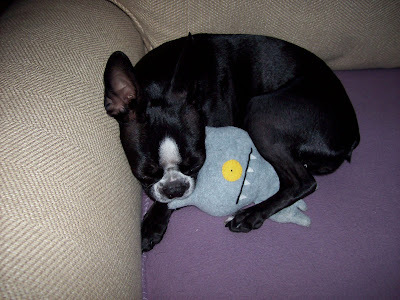 In an twist of irony, the stuffed animal is an "Ugly Doll" who's official name is "Ugly Dog." The fates have aligned against this doggie, but we love her just the same. 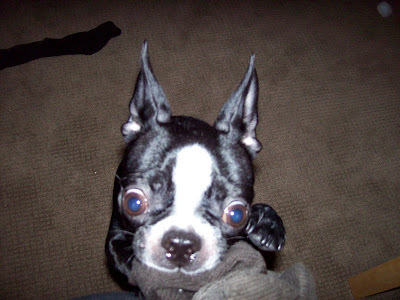 Thanks, Nichole, for sharing your runt with us. Mothra's got some competition. This mini aircraft of a moth flew into the underside of Matt's porch at his place in south Texas. It measured in with a 7 1/4 inch wingspan. Is there anyone out there that can identify this winged beast? I'm sure Matt and his girlfriend would like some assurance that his house isn't being invaded by a fledgling gargantuan. Tokyo wouldn't mind some reassurance either, for that matter. Thanks for the photos, Matt. Did you know that there are two species of turkey? 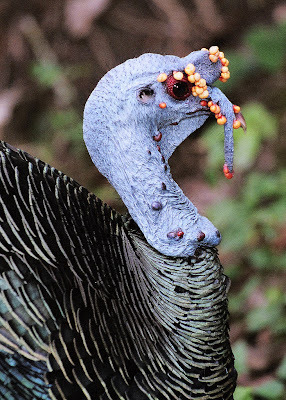 There's the tasty variety from North America (think Thanksgiving or sourdough bread and gravy), but there is also the ocellated turkey found only in the Yucatan peninsula of Central America. Not much is known about this smaller bird. Though, we do know that the nodules found on this male's head will become more pronounced during mating season. I'm so, so glad that humans don't exhibit a similar example of sexual dimorphism. If all human males had to distinguish themselves from females was face warts, our species would be in for a lot of trouble. 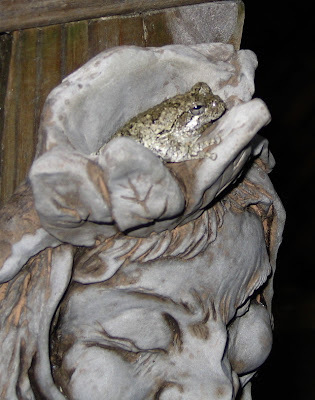 There really isn't a more appropriate place for a toad to hang out than on the head of a witch. ...oh, wait. She's a stone witch. Never mind. Thanks for the photo, Robert. You have an eye for the occult. K has a flair for macros. K also has a flair for cicadas, as seen in these photos from a recent swarm that happened in Illinois (17 years in the making!). This first photo is of a cicada molting from its beetle-looking larval form into its fly-looking adult form. Oh, so much to look forward to, little cicada. 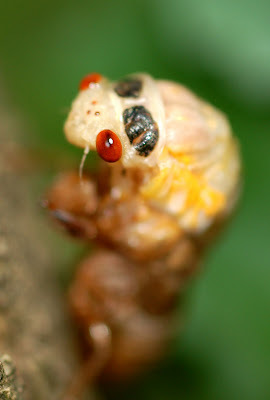 The second shot is of the cross-eyed face of an adult cicada. 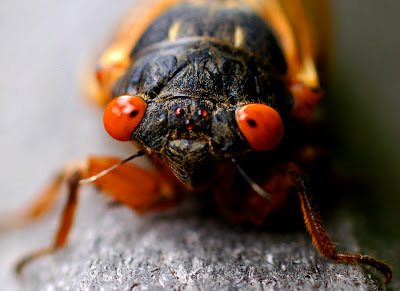 No insects look particularly cute or pretty up close, but cicadas don't even try. If they weren't so big I might like them more. 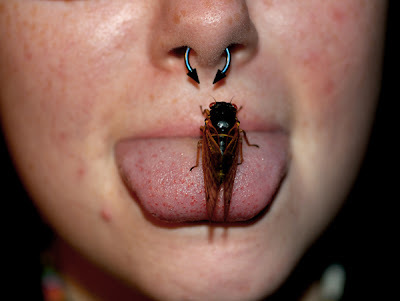 This last shot is of K, complete with nose piercing and a cicada-on-the-tongue adornment. They are all the rage in my neighborhood. Thanks for the photos, K.
Poor Sandy was camping at a KOA in Carlesbad, New Mexico, minding her own business, when she cam across this monster. It turned out that they had booked their camping trip during tarantula mating season! They had to endure them for three days -- they were everywhere. I don't know if I could craft a worse hell for myself if I tried. Camping in the midst of tarantulas! I know some of you would be in heaven, and I don't know what to say to you types. Thanks for the photos, Sandy. I'm glad you made it out sane. Alright, alright. I know. These are gratuitous, unnecessary, and unfair. 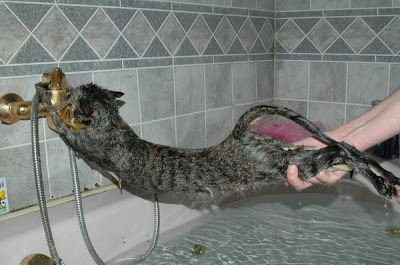 You're guaranteed at least a comical shot when you toss a cat into a bath. 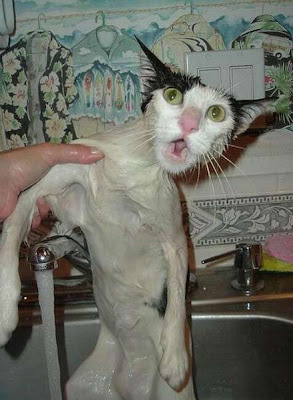 But these pictures really amused me, so I am passing them along. Thanks for the photos, Anna. I can just imagine myself going for a swim in a Mexican river, a nice carne asada taco in my belly. I'm cruising along and enjoying myself when I stick my head underwater and see this staring back at me. 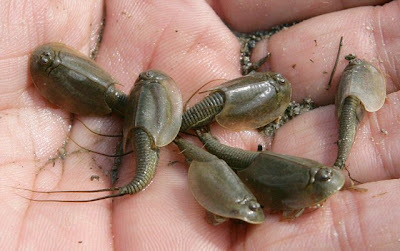 I would assume that I had encountered the aquatic version of Chupacabra. I'd then prepare for my trip to the Underworld. But we all know that axolotl's aren't harbingers of death or anything, right? Right? Thanks for the photo, Pie. You have an eye for evil. Erg. Alas for my lack of Korean-reading-skills (yes, I got this from a Korean site). Can anyone tell me what these are? I would hazard a guess, but I'd be wrong, and then a bunch of you would post the right answer and then I'd feel stupid. I'll forgo that pain and simply solicit your guesses. Thanks for the link, Jessica. You have a good eye for ugly. Joanne encountered this croc while on a trip to Australia. Specifically, this beast resides in the Sydney Aquarium, where he gives people the evil eye day in and day out. I'm thinking this is a saltwater crocodile. Anyone want to confirm that? 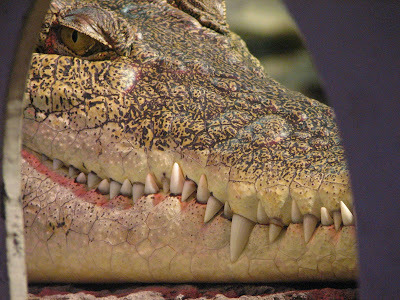 Is there an evolutionary advantage to a crocodile's smile? Or is just meant to freak us out? Great shot, Joanne. I'm glad that you had the glass between you and the reptile. 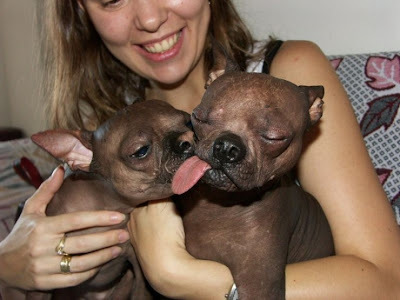 This dog isn't ugly. It might be the coolest dog ever. But since I don't want to start up a blog about muscle-bound canines, I'm posting on it here. You're looking at a whopper of a whippet. These are normally sleek racing dogs. 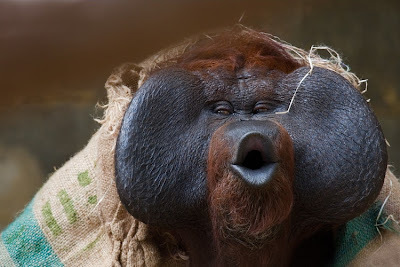 But Wendy here has a genetic defect which has made her double-muscled, resulting in her Barry Bonds style beefiness. She's kind, good natured, enjoys playing around. She's a normal dog except she has, well, double the muscles. The only sad thing is that Wendy is likely to have a shortened lifespan. But she is happy and is otherwise unaware of her condition. I wouldn't being like that myself. Thanks for the link, Peer, Hong, and Aaron. A walker found this while taking a hike on Tasmania's Ocean Beach. 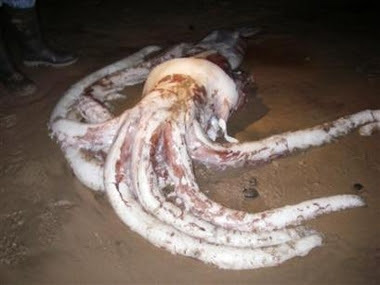 It's being reported as a giant squid (6.5 feet length on the mantle), but I think it might be a colossal squid. As a boy I remember the lore and myth surrounding these massive cephalopods. But it seems lately that the veil of mystery has been pulled back ever since the Japanese caught a live one on film. Now their washing up on shore in increasing numbers. It's like the mollusks have given up -- the cat's out of the bag, why bother staying hidden. Can't science just let us have our monsters? 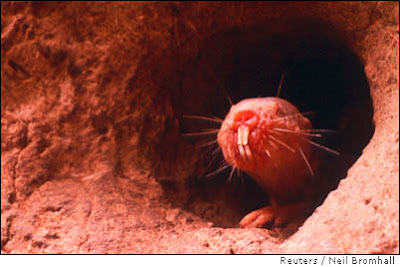 If you hate naked mole-rats, then this isn't the blog for you. I expect I'll return to this rodent every few months, especially when new photos crop up. But you needn't fear that you'll encounter one, unless you are walking the wilds of Africa, or the grounds of one of your nicer zoos. One interesting factoid is that these rats have developed an almost insect-like social structure. Now that ups their charm. Thanks for the link, Karen. I woke up this morning to beautiful sunshine and high hopes. When I walked out the door at 6:15 am, I had every reason to believe that it would be a good day. Until I got to my car. I don't normally open the passenger side door, but I had to today. And thank goodness I did. For this is what awaited me. I am an avowed arachnophobe (unlike many of you reading this). You can only guess at the horror I felt at seeing this garden spider having spun its web in my car overnight. Yep, that's the dashboard to my rockin' 84 Corolla in the background. If you had been a passenger in my car, spidey would have been nibbling on your nose. I've retraced my steps, and I don't know how it got in my car. And I drive it daily, so it only had a small window in which to weave its web, to weave its evil. I'm just glad I had the presence of mind to take some shots of it with my Pentax (my new and beloved toy). I trembled and I had perma-goosebumps for about an hour. After I extracted the arachnid stowaway, I drove to work (a 25 minute commute) swatting at every single itch or tickle I felt. I don't believe I'll ever be the same. 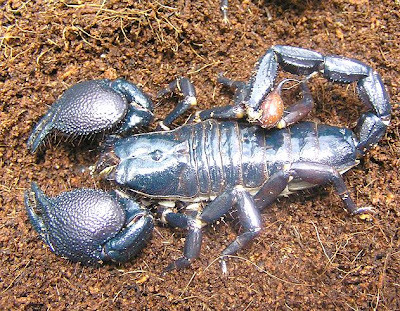 Am I correct in assuming this is an emperor scorpion? Am I correct in assuming that it is cranky? Am I correct in assuming that it would trigger my already hyper-sensitive arachnophobia? It's those gall-dern, segmented legs. They get me everytime. Poor Tiffany encounters this infestation of bugs on her pumpkins every year. Maybe if we can help identify them she'll know how best to ward them off this coming Halloween - after all, knowing is half the battle. 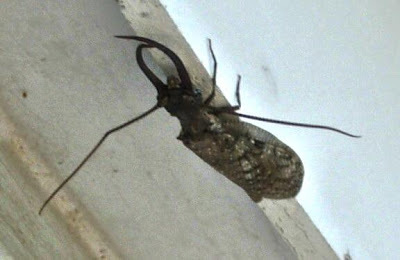 They look to be some sort of squash bug. Any takers out there? Thanks for the photo, Tiffany. 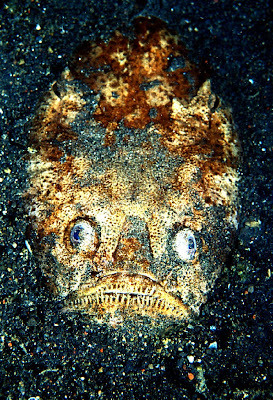 This fish knows his place in life: under the sand and out of sight. Once again, I'm reminded of some people who I wish would have the same wisdom. See, folks, this is exactly the kind of reaction I'm trying to get out of you. 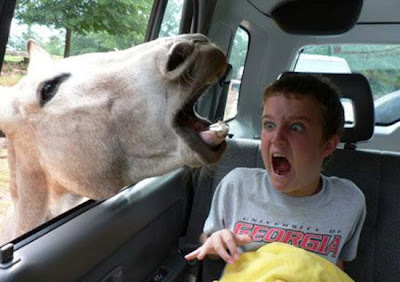 I call it the 'donkey-head-in-car-scaring-boy' effect. I guess you can't expect much from a captive orangutan. In the wild, this dominant male would be swinging through the trees, courting mates, and defending its territory. That's the stuff of life. But here, all he has to work with is a burlap sack. At least he's easily amused. I've never felt compassion for a plant before, but I my heart goes out to these wild flowers. They shouldn't have to endure an ostrich attack like this. 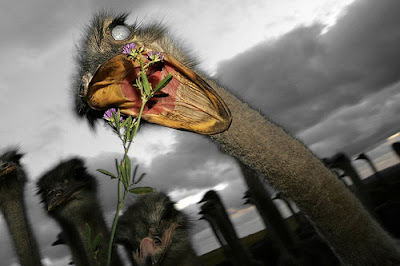 The shot is made all the more freaky by the presence of the out-of-focus birds in the background. Thanks for the link, Tyrel. 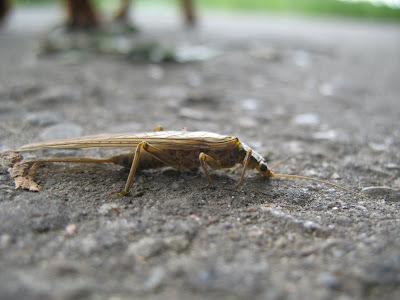 Melanie emailed me a request for a potato bug post. And I aim to please. 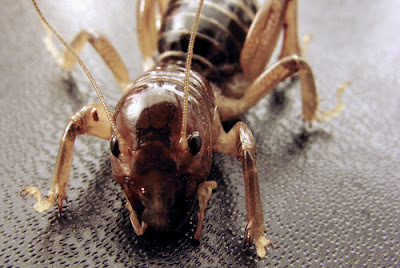 Say hello to our new resident Jerusalem cricket. How can the name of the holy city be given to such an unholy beast? I've encountered these things before, and I'll never be the same. I normally thank those who send me requests. But in this case, Melanie, I can't. I'll be having nightmares thanks to you. This photo comes to you from National Geographic via the good folks over at Zooillogix. 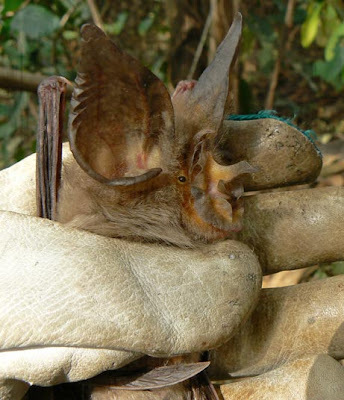 You're looking at the first-ever Maclaud's horseshoe bat to be photographed. This little beast is native to Guinea, Africa, and has not been seen in the wild for 40 years. So it's good news that more (even if only 16 individuals) have been found, all living in the same cave. I think this bat has inspired my next Halloween costume. I just need to figure out how to perform echolocation. Thanks for the link, Rasmus and Miss Cellania. 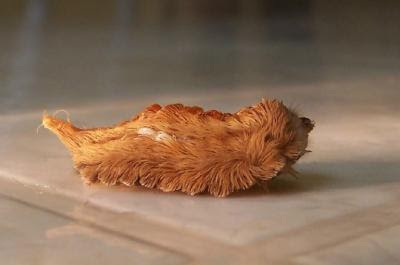 At first glance this puss caterpillar looks to be quite endearing. 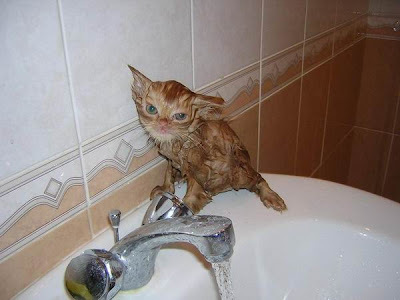 As Patrizio (who sent me the link) says, it is reminiscent of a furby. But don't be fooled by the fuzziness of this North American critter. No, underneath that pile of bug-fur lies a grub with one of the most severe stings known to caterpillars. The sting is delivered through spines that are interspersed among the innocuous-looking fuzz. If you are unfortunate enough to pick one up, you'll get pricked by said spines. A legion will form on your skin, following by redness and the growth of painful, blood-filled cysts. In short, beware the furby caterpillar. Thanks for the photo, Patrizio. Kata sent me this photo. 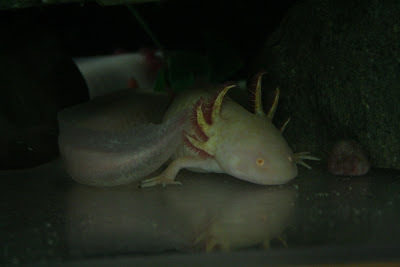 It's an axolotl in a zoo in Korkeasaari. 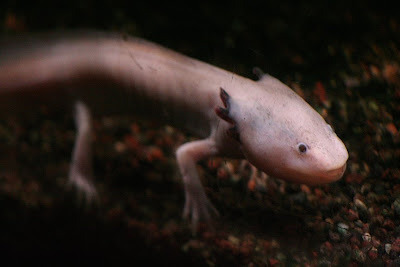 This is a larval salamander native to Mexico. What's unusual about these slippery amphibians is that they often live out their lives without metomorphosing into their adult form. That seems to be a growing trend among humans these days, too. Thanks for the photo, Kata.